In Scripture, a type is an Old Testament reality that foreshadows a greater New Testament reality centering around the person and work of Christ. 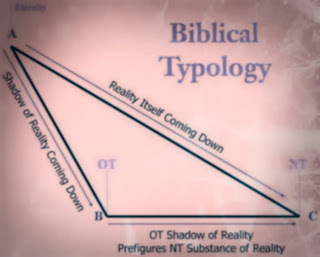 Type and antitype are analogically related, the former being compared to a shadow of the actual reality, thus forming a movement from the lesser to the greater. Apologetically, this is very significant, seeing as human types of Christ in many cases push orthodox superlative descriptions of mere men to their limit, thereby revealing the divinity of the Greater One to whom these superlatives apply in a distinctly superior and literal manner. Your throne, O God, is forever and ever.The scepter of your kingdom is a scepter of uprightness;you have loved righteousness and hated wickedness. Respecting his agentive function, Solomon is identified as “God,” i.e. as God’s representative. However, these verses also identify Solomon’s righteousness as nearly perfectly reflecting the righteousness of God when, in fact, Solomon did not hate wickedness as he should have, choosing instead to engage in idolatry as a result of his marriages to many pagan women. As judicial representatives of God, these men are called “gods” and “sons of the Most High.” Their ontological and ethical nature, however, is clearly not divine. These men “shall die” for judging men unjustly, which demonstrates that (i. )they are mortal and (ii.)sinful. Given the trajectory of progressive revelation, the movement from the lesser to the greater, it follows that if Solomon and the unjust judges of Ps 82 are called “God” in an agentive sense, then it follows that the one who is greater than Solomon, and who judges with perfect justice, cannot be called “God” in the same sense that these OT figures are called “God” (i.e. the agentive sense).